About Kevin - Kevin Cheesebrough Coach, Inc. I come into the coaching profession with significant experience in leadership and career/life transition. For almost twenty eight years I had the privilege to serve in the United State Navy, Submarine Force. Experience gained in leadership led to my very successful command tour as Commanding Officer of the USS Finback (SSN 670). During that demanding tour my crew completed three challenging deployments that included operations in the Arctic. I completed my Navy career as the Professor of Naval Science, The Pennsylvania State University, where I developed over two hundred midshipmen into future Navy and Marine Corp Officers. I also taught leadership and ethics during that period. From the Navy I transitioned to the Applied Research Laboratory at Penn State University where I developed and managed technical programs and the staff. After three years I then moved to the State College, PA office of SRI International where i initially focused on business and program development and then became the site Director of Operations. From 2009 to 2012 I also taught at The Pennsylvania State University, Smeal College of Business, Ethics for Business Managers. I am presently teaching 'Ethics for Coaches' and 'Mindfulness for Coaches' at Duquesne University, Professional Coach Certification Program. 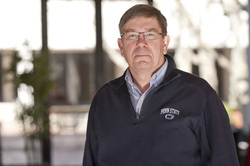 I am an external leadership coach for Penn State and I am an associate leadership coach for Lee, Hecht, Harrison (Pittsburgh). I received my M.S. degree in management science from Rensselaer Polytechnic Institute, and a B.S. degree in nuclear engineering from The Pennsylvania State University. I completed the Duquesne University, Professional Coaching Certification Program in March 2014. I also completed the Center for Self Leadership, Internal Family Systems, Level One training program. I am a certified professional coach, by the International Coach Federation, at the Professional Certified Coach level. So the question you may be asking is 'how did I arrive at the coaching profession at this point in my life'. As possibly many of you are doing I reached that moment where I asked 'what is my real passion' and went on a journey to find true meaning in the second half of my life. That led me on my own personal journey with a life coach. That journey led me to the point where I realized that my talents, my desired work life balance and therefore my passion are fulfilled in the coaching profession. It has been exceptionally fulfilling. I love what I do!